We have shared bunk rooms available for $25 per person. For the Private rooms we ask for a $55 flat fee. The facilities of Pilgrim House include warm and friendly common areas, full baths, a well equipped kitchen and food storage options for guests. We are just about 15 minutes from the airport and downtown by car. We are also on MATA bus lines. We have 2 labyrinths (one inside and one outside) for meditation/prayerful/focused walking. 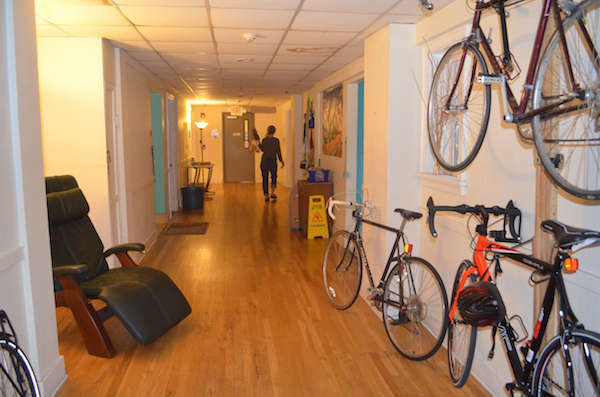 Pilgrim House shares space at First Congregational Church with about 30 shared space partners–which makes for some interesting roaming around the place. Our Global Goods Fair Trade Store provides conscientious gift shopping & education. Through our partnership with Revolutions Bicycle Co-op, we can now rent recycled bicycles for $15 a day. And for those interested, Sunday morning worship begins at 10:30, with a coffee/fellowship time at 10:00. The Pilgrim House Hostel is located in the heart of Cooper Young, a vibrant and diverse neighborhood in Midtown Memphis. The neighborhood, a lively mix of homes, shops and restaurants, is known for its free-spirited ambiance, which attracts artists, musicians, and folks seeking a diverse, creative environment from which to live and work. On top of that, you're only 15 minutes from downtown arenas, the music of Stax Studios and Sun Records, and world famous Beale Street! The Pilgrim House is located in the heart of Memphis, only 15 minutes from the Airport, Megabus, Greyhound, and Amtrak station! Take the #2 MATA bus from Airways Transit Center (stop #7) located next door to Greyhound Station to outbound stop #5 which will bring you to the corner of Young Ave and E. Parkway. Head west down Young Ave towards Cooper St. Before Cooper, take a left onto Blythe. From Blythe you will see a series of 3 yellow brick buildings and a large parking lot. Locate the playground then the double red doors. This is the entrance to the hostel! Input the code given to you by staff then follow the stairs up to the 2nd floor and enter the code again. Voila! You made it! • Follow the signs to I-240 out of the airport complex. • You will be on a road called Airways – stay on this road and do NOT take the actual exits onto I-240. • Stay on Airways for several miles. After you pass a traffic light at Lamar Ave., you will go over a couple of bridges. • After you pass the 2nd bridge, you’ll see a traffic light at Young Ave. Turn LEFT. • Go about 4-5 blocks on Young Ave. and turn left onto Blythe Street. • Go half a block – you’ll see the rear of the church on your right: 3 large yellow brick buildings. • Turn into the back parking lot and park. (If you’re staying in Pilgrim House, you’ll be entering the red door closest to the playground. If you’re staying in the Retreat Center, you’ll be entering the door that goes into the basement of the middle building. We accommodate cancellations on a case by case basis, requiring at least 24 hours notice before scheduled stay in order to consider issuing a refund of deposit. There is a daily nonrefundable deposit ($10 per person for dorm rooms/$22 for private rooms) due upon booking. The nonrefundable deposit will be applied to your total amount due upon arrival. Upon booking you will pay a percentage of the room cost immediately and the remainder upon your arrival. There are no extra charges for booking online through our site. We have a restricted access building. You will need to call us at 901-273-8341 upon your arrival for entry. Open Check in is from 2:00 pm until 9:00 pm, or 2:00 pm until 11:00 pm if you have a reservation and notify us. Please make your travel plans accordingly. If you arrive before2:00 pm, feel free to leave your bags and return for check in. Check in time ends promptly at 11:00 pm. Check out is at 11:00 am on the day of your departure. Feel free to store your bags with us for the day. Because transportation in Memphis is limited without a car, we now provide rental bikes to our guests. The bicycles will allow you to get to see the places you want to see without relying on an unreliable bus system or expensive taxis. For common destinations and bike friendly routes to those destinations, check out our bike map web page at Wayfaring.com. For those traveling by car, there is a large parking lot that is FREE of charge to our guests. We have a seven (7) day stay maximum, so please plan your travels accordingly. 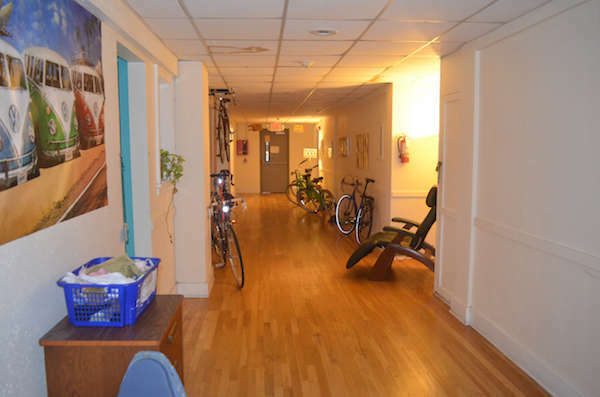 The Hostel is for travelers in groups of less than ten. 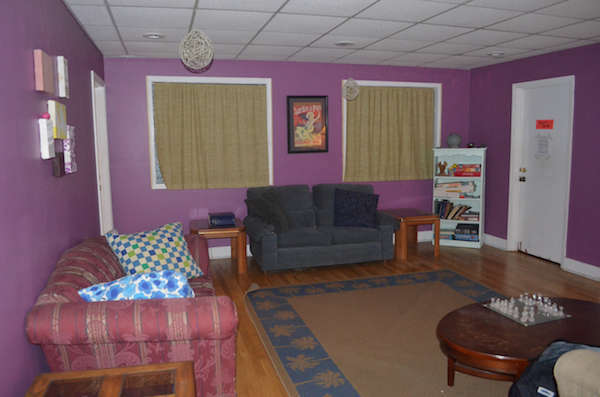 We have a Retreat Center for larger groups.